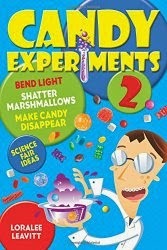 The USA Science and Engineering Festival has chosen Candy Experiments for their "Whiz, Pop, Bang" Chemistry Track. This and three other booths will be recommended to kids who want to try exciting chemistry activities. The festival will be held October 23-24 at the National Mall. Learn more at USA Science and Engineering Festival Expo Tracks.